This training course teaches the basic enter and work skills need to operate in a confined space through a combination of practical and classroom training. On this training course you’ll learn how to identify areas that are constituted as confined spaces, use confined space and industry terminology, complying with the entry and exit procedures, risks and regulations and much more! 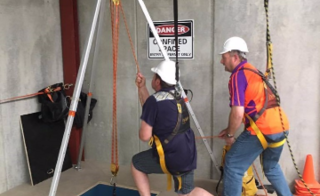 You’ll learn the basic skills needed to enter, work and stay safe in confined spaces. We’ll train you to identify areas that are constituted as confined spaces, use confined space and industry terminology. It is a nationally recognised training course designed for people who work in or around confined spaces. Meet your legal obligations with interesting and 'hands-on' practical training. Practical activities that imitate real world scenarios.